In the Vaults deep underneath Waterloo Station discover Wonderland in all its nonsensical glory. Journey down the rabbit hole to gorge on cakes that will have you bumping your head on the ceiling, smoke a pipe with the Caterpillar as he tells you his psychedelic tale and take tea with the maddest of Hatters; all whilst trying to avoid losing your head at the hands of the fearsome Red Queen. Make your choice and find yourself at the centre of the story as you wander through Wonderland, piecing together the puzzle to search for Alice who’s been lost in the looking glass. Experience immersion like never before in this interactive, puppetry-packed, fusion of story-telling, music, circus and spectacle. It’s the 150th anniversary of Lewis Carroll’s Alice’s Adventures in Wonderland so I’d expect to see a lot of themed activities and events popping up this year. 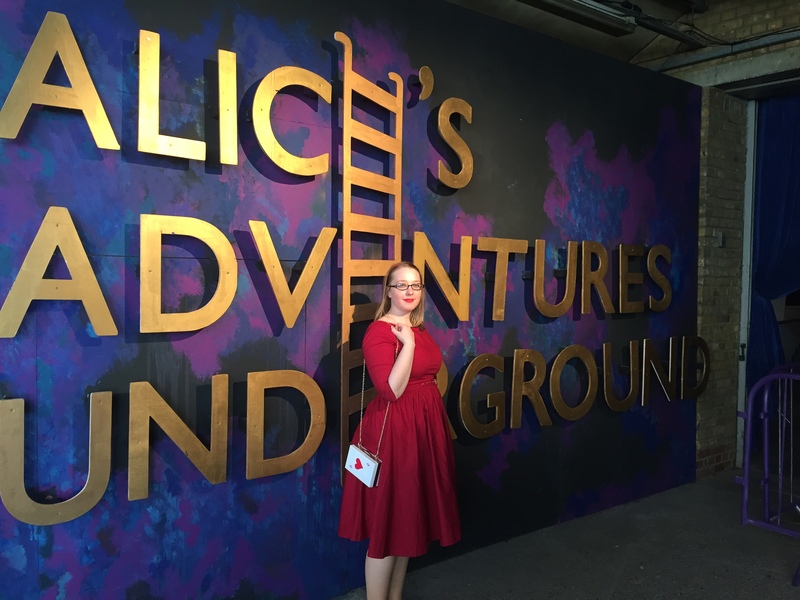 Also, as you should know by now, I’m a lover of immersive theatre so when I discovered that the two were to be combined at the Waterloo Vaults in the spectacular Alice Underground I booked some tickets pretty much immediately and waited impatiently for the day to arrive. After a delicious brunch and an ice cream by the river we set about finding exactly where to go and had a bit of trouble… The entrance to The Vaults on Google maps shows it as being inside the tunnel road opposite the London eye but actually you can’t get in this way and instead have to enter via a different entrance on Launcelot Street. Not a big deal but it did mean that instead of being close to an hour early we were there just in time! My first tip would be to go to the toilet before you arrive if possible as there are only three in the entrance area and the queue can get a bit long. Secondly, it gets hot underground so I definitely recommend that you check in coats and bags at the cloakroom. Take some money with you if you plan to hang out at the bar afterwards. Three, order a tea party cocktail. It’s only a fiver, tastes really good and definitely adds to the atmosphere of the tea party scene. It might not seem fair but it’s totally possible that you won’t have the same experience as whoever you are there with. Sure you have a choice of following the ‘Eat me ‘ or ‘Drink me’ route but even at that point it is possible to be separated from the people you are with. My friends and I went the ‘Drink me’ route and I ended up going a different way from them anyway but it all makes sense when all of you gather again for the finale. Tip number four would be just to go with the flow and enjoy. It’ll allow you to compare notes afterwards too! I’m not going to go into the details of the show as I wouldn’t want to spoil it for you but upon entering the first room I was amazed by the attention to detail. I know it’s not really fair to make comparisons but this really was on par with Punchdrunk in my opinion. The room isn’t as big as it looks so be prepared to squeeze up (there are 52 of you at each show) and look around! The sets are stunning (the caterpillars room being my favourite), the puppetry (in particular a wonderful maniacal Cheshire cat) and acrobatics (those twins!) used in the show are so perfectly coordinated everything works in a madcap way that is just right for an adventure like Alice’s. I have to make specific mention of some truly wonderful uses of tricks of the light that really help the show come to life. I wasn’t too keen on the twist at the end but I enjoyed it thoroughly. So much so that I am already planning to another visit to take the ‘Eat me’ path and see the differences between the two. The show is running until the end of August but it’s already proving to be popular so my fifth tip would be to race to buy your tickets before you can’t and end up missing out! Ive got tickets & cant wait! And if its on par with Punchdrunk, as you mentioned, i’ll definately booking more tickets!